The big concern for the Canadian auto sector against the backdrop of rhetoric of the United States presidential election should not be whether candidates Donald Trump or Hilary Clinton would change or eliminate the North American Free Trade Agreement (NAFTA), but the Trans-Pacific Partnership, experts say. Even if American dissatisfaction with the 22-year-old NAFTA is largely focused on gains made by Mexico, the impact of its dissolution – on Canada, on Mexico, on the United States itself – would make the U.K-Europe Brexit split look like a passing squabble. And never mind the physical wall Trump wants along the boundary with Mexico, when walls of tariffs rise along formerly open borders, the integrated economies of three nations would slam to a halt. But can a U.S. president unilaterally withdraw from an international pact? Experts are divided on whether NAFTA’s wording would give Trump such power. Yet even if the United States. did quit NAFTA ­—and the Americans haven’t bailed on a trade pact since 1866 — Hart is convinced that Canada and its southern neighbour would simply revert to the previous Free Trade Agreement signed in 1988. That might sound good to the Canadian auto industry, which thrived under the FTA — as it did under the earlier Auto Pact agreement — before losing ground as investment turned to Mexico under the continental deal. But few apart from Trump think the abandonment of NAFTA is possible. North American auto trade has more moving parts than an eight-speed automatic transmission, and would be even harder to dismantle. “Once an agreement has been place for 10, 15, and in the case of the FTA, now 28 years, you can’t just undo that by condemning the agreement. All that does is create uncertainty in the investment area,” says Hart, recently retired as Simon Reisman Chair in Trade Policy at Carleton University in Ottawa. Even rearranging it on the plate would be tough. 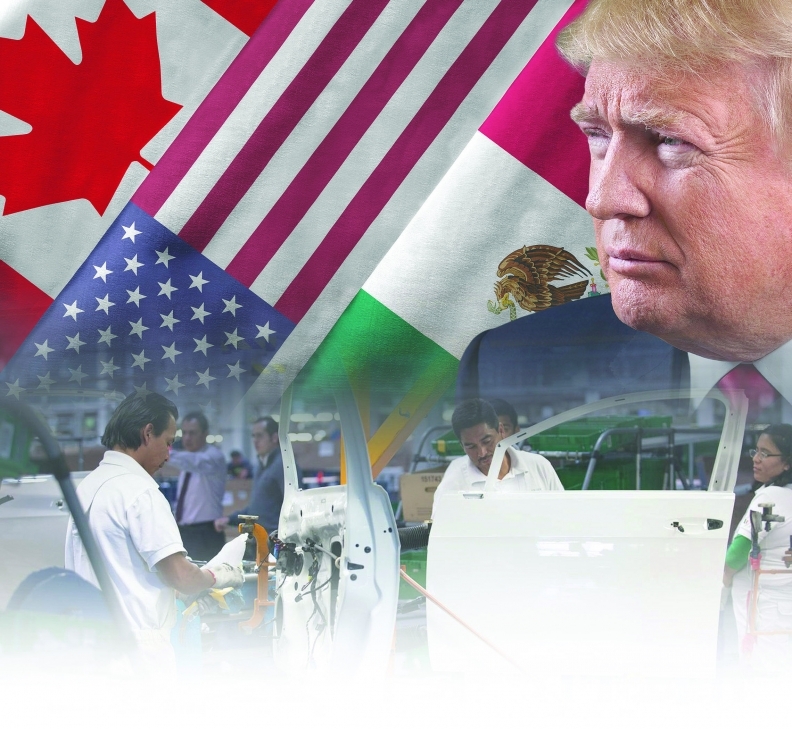 A Clinton presidency trying to exact better terms in a retooled NAFTA would face two partners with their own objectives – Mexico seeking protection for its hard-hit agricultural sector, for example, and Canada certainly looking to reverse the steady decline in auto plants and jobs. But for players such as the Automotive Parts Manufacturers’ Association of Canada (APMA) and Unifor, the union representing employees at the Detroit Three plants in Ontario, a more pressing target is the 12-nation Trans-Pacific Partnership that would supercede NAFTA. Again, both Clinton and Trump oppose the still-unratified pact but again, what they would actually do once elected is unclear. Canadian parts makers, particularly smaller producers without offshore factories, fear that the TPP's reduced regional content requirements — as low as 25 per cent in certain cases — would allow carmakers and parts producers to substitute parts from low-cost nations and still be eligible for tariff exemptions. Under NAFTA, the regional content thresholds are a far steeper 62.5 per cent for finished cars, light trucks, engines and transmissions, and 60 per cent for other parts. Longer phase-in periods in the United States than Canada for tariff reductions on Japanese imports are another concern. Looking for a clearer picture of the impact on Canada, APMA officials are to travel to Washington in September in search of details on how the United States would implement the TPP. “The chief objective is to get as smooth a transition into a post-TPP world as we can, so it really lives and dies with the Americans,” says APMA president Flavio Volpe. For the union, as for the parts manufacturers, what the U.S. does with the agreement is key. Given the statements coming from the presidential candidates, that could mean abandoning the deal or demanding a return to the bargaining table. Unifor research director Bill Murnighan believes Canada’s only course is to be cautious.